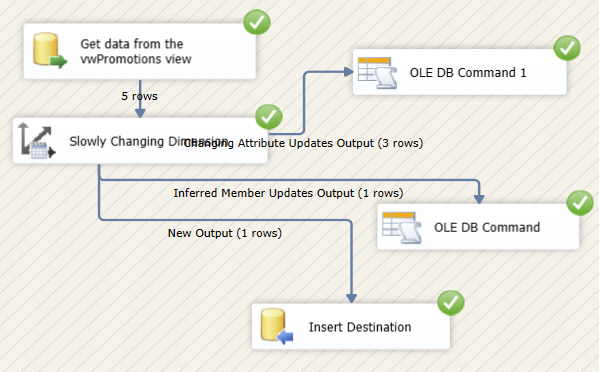 The tick box to enable inferred member support. The third person exists just as a placeholder. 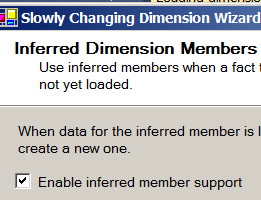 The idea behind inferred members is that you can load placeholders for dimension members, so that a slowly changing dimension transform will modify existing rows, rather than adding new ones. 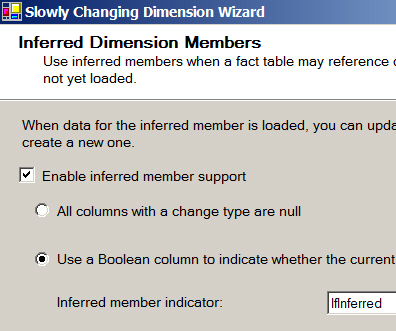 Here we'll assume that a dimension table row is an inferred member if the Boolean column IfInferred says that it is. The numbers of rows are explained below. Wally Owl (person number 4) isn't found in the DimPerson table, and is added as a new output (the bottom path above). Person number 3 is found in the DimPerson table as an inferred member, and so her details are updated from the fact table (the middle path above). The other people (numbers 1 and 2) are found in the dimension table, and their details are updated in the usual way (the top path: there are 3 rows because Rita undergoes two promotions). And having explained at length what slowly changing dimension transforms are, it's time to consider whether you should be using them!